Challenge yourself, learn, enjoy, and earn free curriculum! Welcome to the 2016 Great Books Challenge for Parents! This Challenge is for any parent, but especially for parents who plan to classically homeschool their children, or who are currently homeschooling their children. Classical homeschoolers love Old Western Culture because they see their children coming to the dinner table full of stories, and thirsty for knowledge and wisdom. 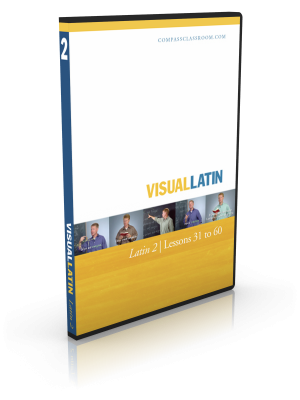 Make 2016 the year classical learning comes alive in your home, and earn free curriculum in the process! Last year’s Great Books Challenge, centered around Virgil’s Aeneid, was a tremendous success! This year we are going to continue and build upon that challenge, adding the following unit, Romans: The Historians, to the challenge. 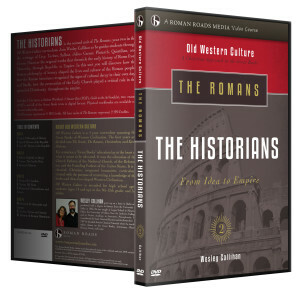 Romans: The Historians, covers the most famous men of Rome, as well as the history of Rome, the persecution of the early Christians, and how the Roman empire influenced the West, especially the founding of the United States. If you complete the challenge by December 31st, 2016, you will qualify for a free unit from the Old Western Culture curriculum, which includes the video set ($56 value), the workbook ($12), and the accompanying Reader ($22 value). Be a parent (children of any age, including expecting). 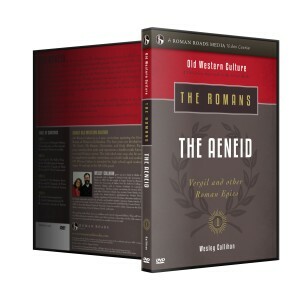 Watch all 12 lectures from either The Aeneid, or The Historians. Complete all reading assignments from either The Aeneid, or The Historians. Fill THIS FORM indicating that you completed the above before December 31st, 2016. To help you get started, we are offering 20% off the price of the materials associated with the Challenge. Enter code “challenge2016” during checkout for a 20% discount on all items related to the Challenge (DVD set, Workbook, and Reader). 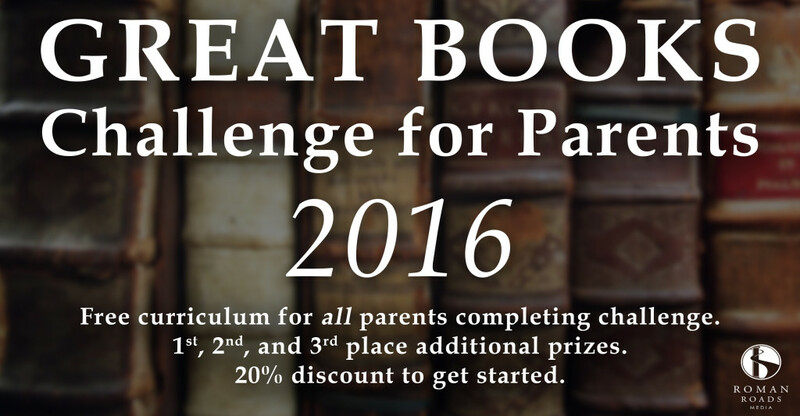 This Great Books Challenge is not a race, however, the first three parents to finish the challenge and fill the form on this page will receive a special prize! We are convinced that parents who use Old Western Culture will LOVE it. And when a parent loves a curriculum, they tell their friends. And word-of-mouth is the BEST way to let people know about this curriculum. 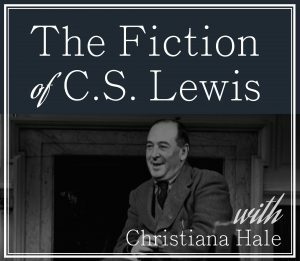 We’re spending most of our time making this the best literature curriculum available, and we need help spreading the word. So help us by USING it, and telling your friends! Click HERE to fill out the form when you have completed the challenge. The form includes an option for choosing your free unit. I’m including a few comments from parents who finished last year’s Great Books Challenge for Parents. Hi, I finished the parent Aeneid challenge yesterday and I am so very happy I did it. Not only am I much more prepared to help my children learn the material in a few years when they reach high school age, but I absolutely loved reading the books! I was a science major in college and never really “got” the excitement for literature and history. Now I realize that literature and history are foundational to our western society. They have become the subjects central to our little homeschooling effort. I have now finished the Aeneid Challenge and much to my surprise, I thoroughly enjoyed and understood it all. I was terribly intimidated before I began but within the first lesson my apprehension evaporated and I couldn’t wait to move on to the next section! Thanks so much for issuing the challenge as I can’t wait to begin with my daughter in a few months! Hi there, I took up the Aeneid challenge this year and wanted to let you know that I completed it! The Aeneid was the first “Great book” I have ever read and I am amazed at how much I have learnt. 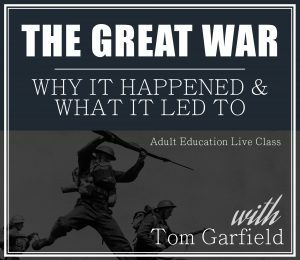 Being publicly educated, we didn’t have the education that we hope to give our children and had very little exposure to most of the ‘greats’ (both books and individuals). I suggested we begin to learn these things now, though our children are younger, so we will know a bit about what we will be teaching when the time comes. Your great books challenge was just the impetus we needed to dive in- and we are so glad we did! We were both amazed at the vast knowledge that just seeps out of Wes Callihan–it is clear he is not reading from a script but teaching through conversation…a style we both loved. And he teaches in such a way that even huge spans of history or daunting subjects can be made both understandable, fascinating and downright pleasant to discover. 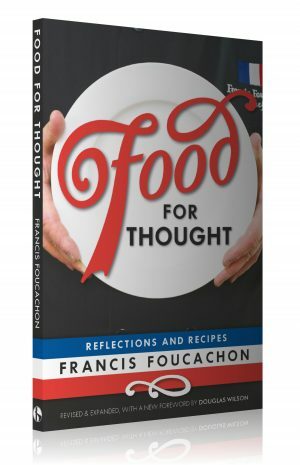 We are very excited for this incredible resource for ourselves presently and for our children in the future! Share this page or this image with your friends! I finished the Aeneid challenge. Is there a form to fill out yet? Angela, very sorry for the delay! The form is now up! I completed the Historians challenge and was also wondering if there was a form to fill out yet? Thanks for your help. Jennifer, very sorry for the delay! The form is now up! Is there a link to the 2017 challenge yet? ?